Welcome to Pickwick Stables Online. Our business is Hunters, Jumpers, Equitation, Training and Horse Sales. We are dedicated to promoting the equine industry through education, classical riding foundations, and a vision of the future. Our well-appointed facility is convenient to Baltimore, Washington, Columbia, Ellicott City, Westminster, Mt. Airy and Frederick, MD, and we are easily accessed from Routes 70, 695, 95, 32, 26, 140 and 97. Dedication Farm is a beautiful and spacious property nestled in the hills of Carroll County, Maryland. Our outdoor rings overlook the lovely Piney Run Lake. And for cooling down or for a trail ride, we have open areas and woods on our property, and access to the 2 miles of parkland trails leading to Liberty Reservoir Dam. The farm is owned by and operated by James M. Prettyman and Danny and Janet McFarland. Mr. Prettyman is a Hunter/Jumper instructor/trainer with over 25 years of experience. His unique blend of talent, expertise, compassion, and humor produces remarkable horses and students. 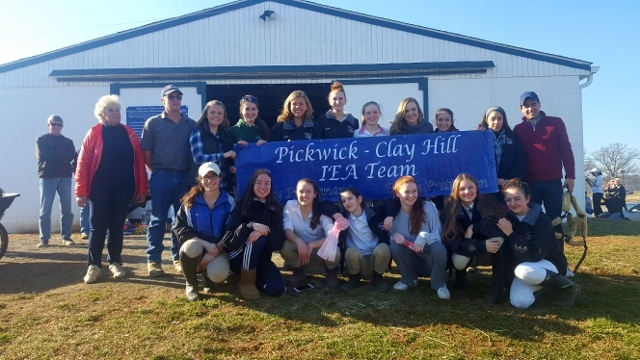 Pickwick’s beginners learn safety and classical form on our school mounts or their own, and our competitive riders are regulars in the hunter/jumper rings on the circuits in Maryland, Pennsylvania and Florida.